Hangzhou is a sub-provincial city located in the Yangtze River Delta in the People's Republic of China, and the capital of Zhejiang province. Located 180 kilometres (112 mi) southwest of Shanghai, as of 2004 the entire Hangzhou Region or Prefecture-level city had a registered population of 6.5 million people. The urban agglomeration of the Hangzhou metropolitan area has a resident population of 3,931,900 as of 2003. As one of the most renowned and prosperous cities of China for much of the last 1,000 years, Hangzhou is also well-known for its beautiful natural scenery, with the West Lake as the most noteworthy location. Hangzhou Region or prefecture-level city contains the Hangzhou metropolitan area (eight districts), 3 metropolitan counties, and 2 ordinary counties. The central six urban districts occupy 682 km2 (263.4 mi2) and have 1,910,000 people. The two suburban districts occupy 2,642 km2 (1020 mi2) and have 1,950,000 people. Hangzhou’s climate is Humid Subtropical with four distinctive seasons. The average annual temperature in Hangzhou is 16.2°C (61.2°F). The summers are hot and humid, while winters are relatively cool and dry. In July, the hottest month, the average temperature is approximately 33.8°C (92.8°F); in January the average temperature is about 3.6°C (38.5°F). Hangzhou receives an average annual rainfall of 1450 mm. In mid-summer, Hangzhou, along with other cities in Zhejiang province, suffer typhoon storms, but typhoons seldom strike it directly. Generally they make land along the southern coast of Zhejiang, and affect Hangzhou with str ong winds and stormy rains. The GDP per capita was ￥61,313 (ca. US$8,063), ranked no. 8 among 659 Chinese cities. 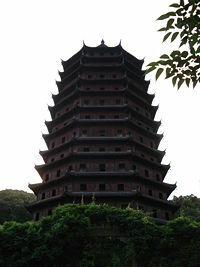 The 2005 overall rank of Hangzhou among all the Chinese cities is No.5. In 2004, 2005, 2006 Forbes magazine ranked Hangzhou the number 1 city in China for business. Hangzhou’s industries have traditionally been textile, silk and machinery, but electronics and other light industries are developing, especially since the start of the new open economy in 1992. Toshiba has its only overseas production plant for laptop computers here. Wahaha, the nation’s largest beverage company is headquartered in the city. Longjing tea is produced on the outskirts of town at Longjing or Dragon Well. It is among the only remaining places where tea is still baked by hand and is said to produce one of the finest green teas in all of China, earning a spot in the China Famous Tea list. The native residents of Hangzhou, like those of Zhejiang and southern Jiangsu, speak a Wu dialect. However, the Wu dialect varies throughout the area where it is spoken, hence, Hangzhou’s dialect differs from regions in southern Zhejiang and southern Jiangsu. In addition, Putonghua (Mandarin) is also spoken. Tea is an important part of Hangzhou’s economy and culture. Hangzhou is best known for originating Longjing, a famous variety of green tea. Furthermore, there are many types of Longjing tea, the most famous being Xi Hu Long Jing. Known as the best type of Long Jing tea, Xi Hu Long Jing is grown near Xi Hu in Hangzhou, hence its name. Further, Hangzhou is known for its artistic creations, such as silk, umbrellas, and Chinese hand-held folding fans. Bars and Shops alongside the street of Hangzhou.Hangzhou is serviced by the Hangzhou Xiaoshan International Airport, which has direct flights to Japan, Thailand, Korea, and Singapore, regional routes to Hong Kong and Macau, as well as numerous domestic routes. Located just outside of the city in the Xiaoshan district, it is one of the major secondary international airports in China. A convenient route to Hangzhou for foreign visitors is to first fly into Shanghai’s Pudong airport, and then take bus to Hangzhou using the Shanghai-Hangzhou-Ningbo Expressway . Driving time from the airport to Shanghai is about 2.5 hrs (about 85 RMB one way), Suzhou is about 1.5 hrs, Wuxi is about 2 hrs, Ningbo is about 1.5 hrs and Wenzhou is about 3.5 hrs. Airport buses leave for Wulin Men (downtown Hangzhou) (15 RMB one way) and Xiaoshan (also 15 RMB one way) every 15-30 minutes. There are also airport buses to prefectures further away near Hangzhou such as Yiwu (30 RMB one way). Hangzhou Railway Station (colloquially the "City Station") and the significantly less modern Hangzhou East Railway Station (colloquially "East Station") serve the city centre, from which one can catch a train to Shanghai and almost anywhere in China. There are many trains going to or passing Hangzhou from Shanghai. Since 2006, it only takes 1h18 from Shanghai South Railway Station to Hangzhou, and costs around 50 RMB. Trains leaving Hangzhou reach more than 20 cities directly, including Beijing (1650 km), Shanghai (200 km), and Xi'an (1550 km). Train tickets can be purchased at the Wulinmen Ticket Office (No. 199, Wulin Road) or Huansha Road Ticket Office (No. 147, Huansha Road). A Shanghai-Hangzhou Maglev Train Line has been proposed. North, east, south and west long-distance bus stations offer regular large and small coach services to towns within Zhejiang province and surrounding provinces. Transrapid has now been contracted to construct an extension of the existing Long Yang Road - Pudong International Airport Maglev line. This would be the first inter-city maglev line in the world; it is now undergoing environmental assessment. Public transport within Hangzhou city is primarily in the form of an extensive public (trolley) bus network. As the city area is so flat, bicycles were traditionally very popular and are still popular with the less well-off residents, though many now use electric bicycles and scooter (Motor cycle)s. Taxis are also very common. With its line of the newest Hyundai Elantras and Volkswagen Passats, and tight regulations (compulsory A/C, handicap service, lake-blue appearance etc. ), the city's taxi service is rated amongst the top in the country. The construction of a subway system had long been planned, and recently received approval from the central government. The completion of the first two lines is expected in 2010.